President Obama and Governor Christie spoke after their helicopter tour viewing what Sandy left in her wake along the Jersey Shore. Some refer to them as a new iteration of the odd couple. Some of you may recall that Governor Christie railed at the President in his key note address at the Republican National Convention. And yet, here they are conspiring for the good of the people. "I just want to tell all of you exactly what the president just said. I know he means it," Christie said. "I want to thank the president for coming here today. It's really important to have the president of the United States acknowledge all the suffering that's going on here in New Jersey, and I appreciate it very much. We're going to work together to make sure we get ourselves through this crisis and get everything back to normal. Thank you for coming, sir." 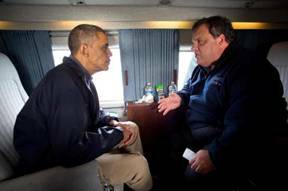 Obama returned the praise, saying Christie had been "responsive" and "aggressive" even before "this incredible storm.... The people of New Jersey recognize that he has put his heart and soul into making sure that the people of New Jersey bounce back even stronger than before. So I just want to thank him for his extraordinary leadership and partnership." Together, the two men cut a surprising image of bipartisanship and cooperation that was what the President had hoped for when he ran for office. I hope and pray for renewed bipartisanship and cooperation! From your lips...It's the only way things will really change. I just keep praying that Mitch & his gang will wake up & discover that they are undermining the well-being of the nation, and not just their arch enemy, the black man in the white house. Also, I think they forget that they & their compatriots will want our support for issues and maybe themselves & they are not giving us any reason to go out of our way to accommodate them unless they change their evil ways.